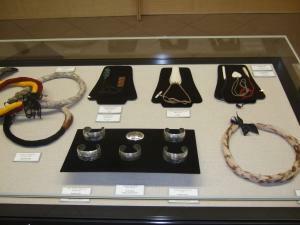 The UH Mānoa Library premiers contemporary works from artists of the 2007 PIKO Gathering and the HOEA Native Hawaiian Art Project in Hamilton Library’s Bridge Gallery from June 6 – August 28, 2011. The exhibit will be open during Summer semester building hours: Monday-Friday 8 a.m.–6 p.m. and Sunday noon-6 p..m.; closed on Saturday. 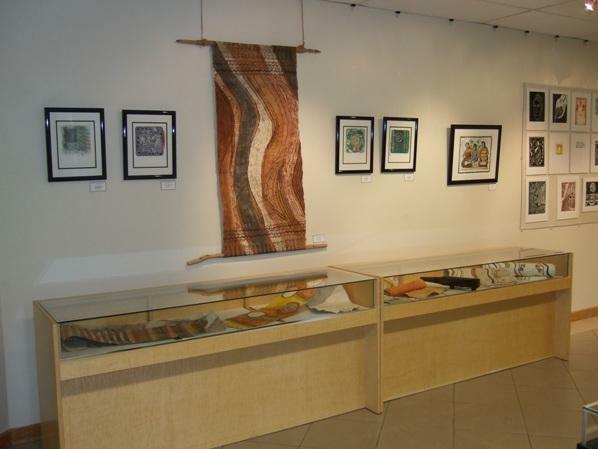 Curated by artist Harinani Orme, the exhibit features diverse mediums of 170 works by 73 PIKO and HOEA artists that include kumu, haumana, Keomailani Hanapi Foundation (KHF) board and steering committee members. In 2007, the PIKO Gathering of 115 indigenous visual artists (23 First Nations, 38 Maori, 6 Pacific Islanders, and 48 Native Hawaiians) was held in Waimea on Hawai‘i Island. 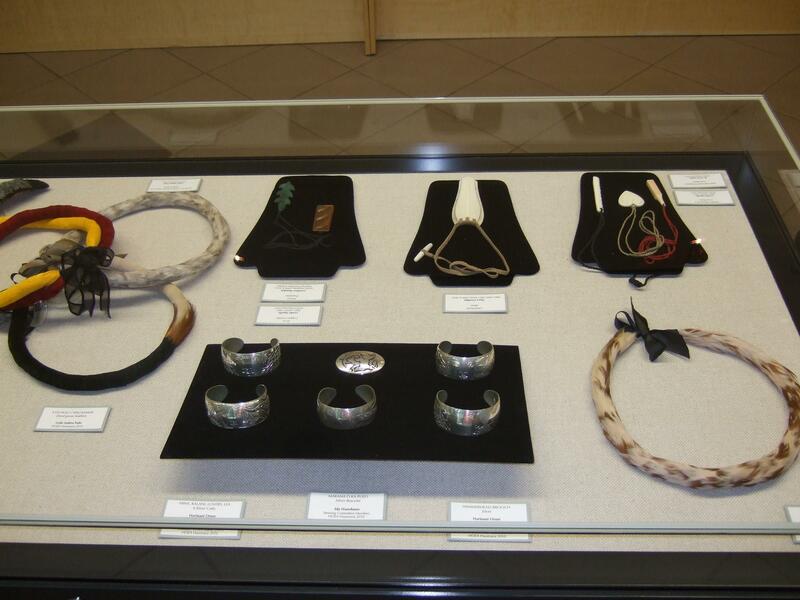 The PIKO Gathering consisted of three days of cultural exchanges, five days and nights of art making by PIKO artists that produced 136 pieces of art in drawing, painting, printmaking, jewelry, glass, ceramics, wood, stone, fiber, and video. 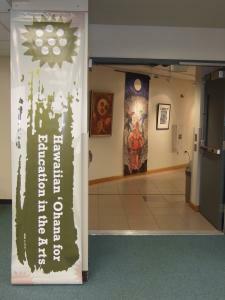 It was this gathering that sparked the launch of Hawaiian ‘Ohana for Education in the Arts (HOEA), an innovative three-year pilot project for Native Hawaiian art education sponsored by the Keomailani Hanapi Foundation (KHF), and funded through grants from the Administration for Native Americans (ANA), Office of Hawaiian Affairs (OHA), the Richard Smart Foundation and Hawaiʻi Tourism Authority. The HOEA Studio Program is a post-secondary level art school for emerging and professional artists that aims to develop participants’ art skills to higher levels by working closely with Hawaiian and indigenous master artists. This unique approach to arts education is inclusive and intergenerational with a focus on contributing services to artists in the Hawaiian community. HOEA’s master kumu are dedicated to teaching from the wellspring of Hawaiian culture and tradition, as well as contemporary art forms by creating deep and lasting opportunities for all. HOEA also has a public showcase for artists, called the PIKO Gallery, which opened in 2010 in Waimea on Hawai’i Island. HOEA also sponsors the HOEA Market, which provides an opportunity for Kanaka Maoli artists to showcase and sell their art. The organization’s goal is to build a Community Art Center in the target community of Waimea, South Kohala, Hawai’i Island and establish a post-secondary School of Hawaiian Fine Arts. For more information, please contact Teri Skillman, Events & Communications Coordinator, at: skillman@hawaii.edu or call (808) 956-8688 on weekdays.